Frailty is defined as a clinical syndrome of multisystem impairment that results in a decreased physiologic reserve and an increased vulnerability to stressors. Frailty is a condition not strictly related to age or other medical problems, and frail individuals are at higher risk for complications after surgery. In patients with cardiovascular disease, frail patients have a worse prognosis. Mortality rates have been shown to be higher in frail patients medically treated for acute coronary syndrome, patients who underwent percutaneous coronary intervention, and patients undergoing cardiac surgery. As we come to recognize the clinical significance of the frailty syndrome – knowing that it affects multiple organ systems – it is not unreasonable to hypothesize that frailty might be predictive of risks other than mortality in patients who require surgery. Aspiration is one such risk. Laryngeal penetration has previously been associated with frailty in the elderly, and patients undergoing cardiac surgery have an increased risk of aspiration. A relationship between frailty and aspiration risk following cardiac surgery, however, has not previously been defined. Numerous tests and scales have been used to define and quantify frailty. There is no definitive “gold standard” when testing for frailty, as frailty is a complex entity described using five core domains: slowness, weakness, low physical activity, exhaustion, and shrinking. Gait speed – a measure of slowness – is the most commonly used objective test for frailty in patients undergoing cardiac surgery. Gait speed is an incremental predictor of mortality and major morbidity in elderly patients undergoing cardiac operations. As opposed to more complex tools to evaluate frailty, gait speed is simple, fast, reproducible, and inexpensive. Like frailty, the risk of aspiration is less a distinct clinical entity than a complex clinical syndrome with multiple underlying pathologies. The 90-mL water swallow challenge protocol is a simple, cost-effective means of assessing aspiration risk in hospitalized patients that allows for the safe initiation of an oral diet without additional testing. This screen is sensitive and specific, with a low false-negative rate, and can detect both silent and overt aspiration. Our aim was to determine if screening for frailty using gait speed could identify patients at risk for aspiration as demonstrated by the 90-mL water swallow challenge. A single 245-bed community hospital was the site of a prospective cohort study performed between May 2013 and May 2014. This study population was comprised of patients at least 65 years old undergoing nonemergent cardiac surgery using cardiopulmonary bypass who could be evaluated preoperatively. Informed consent was obtained before enrollment. This study was approved by the Institutional Review Board for Intermountain Healthcare. One hundred and sixty-six (56.8%) of the 292 patients who underwent cardiac surgery during the study period met enrollment criteria and completed both a frailty assessment and both swallow screens. Of the 126 patients excluded from the study, 23 either refused, were missed in the enrollment or screening process, or were not sufficiently ambulatory to perform the walk test. Of the 103 patients who did not meet inclusion criteria, 79 were < 65 years old, and 24 could not be properly evaluated before surgery (15 required emergent surgeries and 9 had intra-aortic balloon pumps). Gait speed was assessed using a 5-m walk test. Each patient was accompanied by an exercise physiologist to a designated area marked at zero and 5 m. The patient was instructed to walk at a comfortable pace past a 5-m mark. Patients were allowed to use any assistive device that was routinely used outside of the hospital setting. Timing began at the first footfall after the 0- m mark and stopped at the first footfall after the 5-m mark. Each patient completed three timed trials, allowing time for recuperation between each trial. Patients were considered frail if the average time was equal to or >6 s. Baseline and postoperative characteristics were evaluated across the frail and not frail groups. The aspiration risk assessment was performed by experienced acute care speech-language pathologists (SLP) trained by a Board Certified Swallowing Specialist. The preoperative screen was performed on the day before surgery. An SLP screened each patient, evaluating the patient's speech, cognition, and oral mechanism. Once the patient completed this screening process, they were asked to drink 90 ml of water in one continuous motion without stopping or coughing. Patients unable to complete the drinking task successfully were classified as having failed the swallow screen. These patients would receive a formal clinical bedside swallowing evaluation that included observation of the patient eating a meal before surgery. The swallow screen was performed again postoperatively – between 6 and 24 h after surgery – when extubated, awake, and alert enough to participate. Patients who failed the swallow screen pre- or post-operatively were placed on aspiration precautions after surgery. Patients were stratified into two groups based on the result of the swallow screening test. All patients had an orogastric tube placed at the end of the surgical procedure and removed before extubation. Transesophageal echocardiography (TEE) was used at the discretion of the operating surgeon and anesthesiologist. For categorical variables, comparisons were evaluated using Chi-square test (or Fisher's exact test where assumptions were not met). The independent t-test was used to compare means for continuous variables. Correlation between frailty and aspiration risk was analyzed using Pearson's correlation. Comparisons were made between frail and nonfrail patients as well as between preoperative (PREOP) and postoperative (POSTOP) swallowing screens. Simple logistic analysis was performed to identify potential predictors of frailty and aspiration risk. Variables were then selected for inclusion in multiple logistic regression models to adjust for possible confounding. The P < 0.05 was considered statistically significant. Statistical analyses were performed using STATA release 12.0 (College Station, Texas, USA). Speech and cognition were unremarkable in all 11 patients (6.6%) who failed the PREOP screen. Thirty patients (18.1%) were considered frail based on the results of the 5-m walk test. The average time to walk 5 m in this group was 7.94 ± 2.29 s. In comparison, those not deemed frail by the 5-m walk test completed the walk in an average of 4.15 ± 0.82 s. Comparisons of demographics and comorbidities (as defined by the Society of Thoracic Surgeons) by the results of the 5-m walk test are outlined in [Table 1]. Age, gender, and comorbidities were similar between the groups and not predictive of frailty. 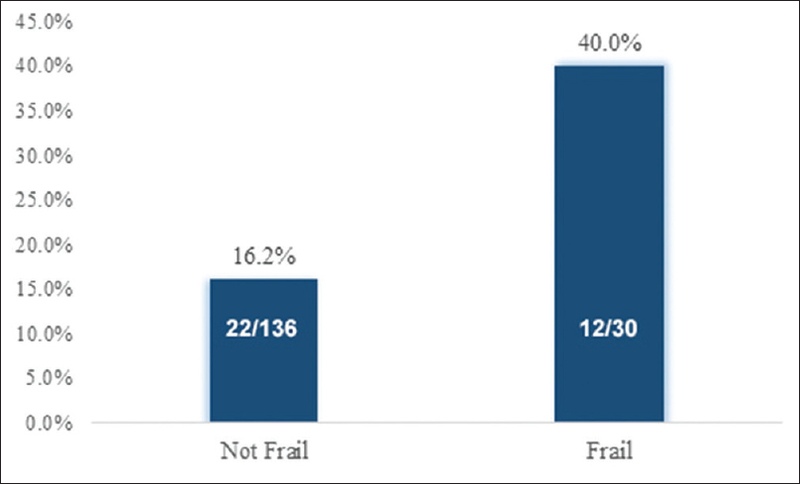 Four of the eleven patients (36.4%) who failed the PREOP screen were categorized as frail. The following procedures were performed on the study cohort: eighty-nine patients (53.6%) had coronary artery bypass grafting only, 20 patients (12.0%) had isolated aortic valve replacement, and 11 patients (6.6%) underwent isolated mitral valve surgery (repair or replacement). In addition, 19 patients (11.4%) had combined coronary artery bypass grafting and aortic valve replacement and 27 patients (16.3%) had other procedures including multiple valve operations, atrial fibrillation surgery, and aortic surgery with or without coronary artery bypass grafting. The types of surgical procedures performed were similar between the frail and nonfrail groups. 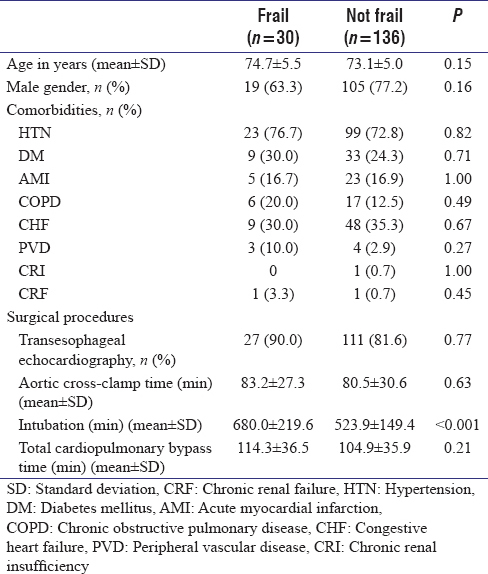 Key operative times (aortic cross-clamp [XCL] and total cardiopulmonary bypass [CPB]), total intubation time, and TEE use are listed in [Table 1]. TEE, XCL, and CPB were not significantly different according to frailty status. Frail patients, however, were intubated significantly longer compared to nonfrail patients (680.0 ± 219.6 vs. 523.9 ± 149.4, P < 0.001). Thirty-four patients (20.5%) failed the POSTOP swallow screen. All patients who failed the PREOP screen also failed the POSTOP screen, and this group accounted for a substantial proportion (32.4%) of the POSTOP failures [Figure 1]. 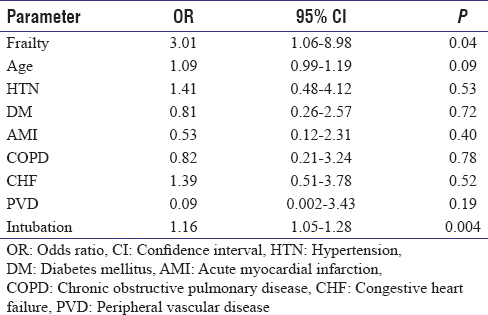 Patient characteristics, comorbidities, and surgical procedures stratified by the results of the POSTOP swallow screen are compared in [Table 2]. The only traditional demographic factor or comorbidity that was predictive of swallow screen failure was age. Frailty, also, was associated with postoperative aspiration risk. Univariate regression analysis revealed that the frail patients were more than three times as likely to fail the swallow screen as their nonfrail counterparts (odds ratio [OR] =3.45; 95% confidence interval [CI]: 1.46–8.17; P = 0.01). The association between frailty and aspiration risk remained strong (OR = 3. 38; 95% CI: 1.25–9.11; P = 0.02) after excluding patients who failed the swallow screen preoperatively – those with an inherent aspiration risk unrelated to the surgery that followed. [Figure 2] demonstrates the likelihood of swallow screen failure based on frailty status. 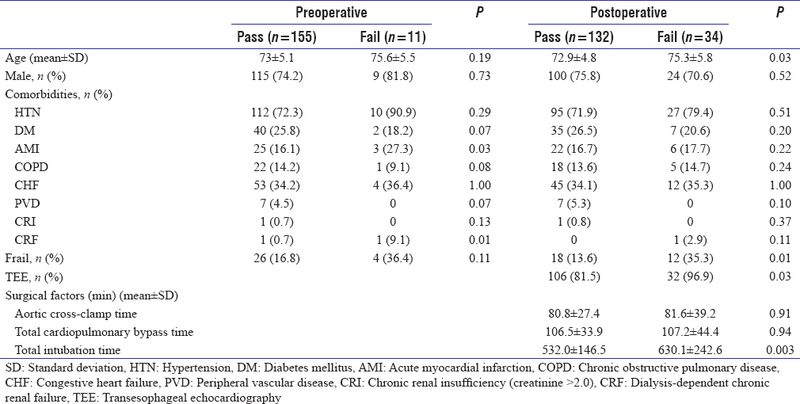 Neither type nor duration of surgery was associated with aspiration risk [Table 2]. Patients who had TEE, however, were significantly more likely to fail the swallow screen when compared to those who did not have TEE (P = 0.03). Intubation time was also significantly longer in those who failed the swallow screen. As shown in [Table 3], after adjusting for age, comorbidities, and intubation time, the 3-fold increase in the likelihood of swallow screen failure remained for frail patients versus nonfrail patients (OR = 3.01; 95% CI: 1.06–8.98; P = 0.04). The only other factors that were significantly related to aspiration risk on multiple regression analysis were age and intubation time. Only one patient (0.6%) in the study group had a complication that was potentially aspiration-related. This patient had failed the POSTOP screen and was under treatment by our speech pathologists but still developed pulmonary infiltrates. Aspiration can be a potentially devastating complication after any major surgery, and patients undergoing cardiac surgery are at increased risk. Cardiovascular illness requiring surgery is more common in the elderly, our procedures are often complex and can require prolonged intubation and very often we directly instrument the pharynx and the esophagus with TEE during the procedure. All of these factors have previously been shown to increase aspiration risk postoperatively. Aspiration can cause pneumonia and prolonged intubation. In extreme cases, multi-organ system failure and death can result. Some complications, such as postoperative hemorrhage and early graft closure are clearly related to the surgical procedure. Other complications, such as aspiration, deep venous thrombosis, and pulmonary embolism are often written off as “bad luck.” Understanding risk factors and utilizing preventative treatment have been shown to reduce the incidence of venous thromboembolic complications after surgery. It may be that other “unavoidable” complications – like aspiration – might be potentially preventable with early recognition and preventative treatment. These results demonstrate that aspiration risk may be present before surgery and that it is a more common preexisting condition in frail patients (36.4% [4/11] vs. 5.1% [7/136]). Aspiration risk following cardiac surgery is a more common problem, and we found that frail patients were again much more likely to be at risk (40.0% vs. 16.2%). When we excluded those patients who had evidence of aspiration risk before undergoing surgery, the relationship between frailty and aspiration risk persisted. Screening for frailty with the 5-m walk is a simple tool that provides valuable information to risk-stratify for mortality after cardiac surgery and is already part of the STS adult cardiac database. Our data suggest that this additional piece of information that is already being collected by some institutions might be predictive of adverse outcomes other than mortality and may provide an opportunity to practice preventive medicine. While aspiration risk is much more common in frail patients, not all frail patients' demonstrated risk of aspiration on their swallow screen and not all patients who failed the swallow screen were frail. As such, screening for frailty alone would have missed nearly two-thirds (22 of 34 patients) of those at risk of aspiration. The 90-mL water challenge is an inexpensive test that can identify patients at risk for serious aspiration-related complications. This predictive assessment may be obtained for the relatively modest cost of $9.53, which we estimate based on the time taken (10 min) and the hourly wage plus benefits of our SLP. By coordinating with our exercise physiologists and SLPs, we have been able to incorporate both the 5-m walk test and the 90-mL water swallow challenge into our preoperative evaluation of nonemergent patients without an increase in staffing. The actual cost to the system is minimized by more efficiently utilizing our existing staff. The 90-mL water challenge protocol identifies patients at risk for aspiration. Patients that fail the screening test are referred for a more extensive Clinical bedside evaluation and an instrumental evaluation if needed. This process allows the SLP to identify the physiological reason for the aspiration, and the compensatory strategies needed to teach the patient how to protect their airway. Swallowing strategies and pulmonary clearance tasks are relatively easy to teach and when implemented, reduce the risk of aspiration and its complications. Whereas, the 5-m walk test only allows us to recognize and document those with frailty, the 90-mL water challenge offers the opportunity for preventative intervention. Swallowing therapy, which may include teaching compensatory strategies, provides safe interventions that can positively impact patients' outcomes. Our study has limitations. Lack of a control group makes it difficult to compare outcomes. With our screening and treatment protocol for aspiration risk, we only observed one pulmonary complication which might have been related to aspiration (pneumonia not ventilator acquired) in 166 patients undergoing cardiac surgery. While this was an improvement over past years at our institution, the lack of a control group for comparison limits our ability to comment on the effectiveness of this screening algorithm in preventing complications. A prospective, randomized trial would be necessary to demonstrate this benefit convincingly. In addition, as the results reflect the findings of a single institution, further study is needed to verify if similar results are found elsewhere. A quick, inexpensive, and reproducible swallow screen before starting oral intake in patients known to be at higher risk for aspiration intuitively makes sense. Others have shown – and our data supports – that age, intubation time, and the use of TEE are factors that increase the risk of aspiration in patients undergoing cardiac surgery. We also found frail patients to be at increased risk. As these four factors encompass a significant proportion of cardiac surgical patients, we recommend performing a 90-mL water swallow challenge after all cardiac operations before offering patients an oral diet. Patients who are unable to pass this screen should be referred to an SLP for a formal clinical bedside swallowing evaluation to reduce the risk of aspiration postoperatively. Fried LP, Ferrucci L, Darer J, Williamson JD, Anderson G. Untangling the concepts of disability, frailty, and comorbidity: Implications for improved targeting and care. J Gerontol A Biol Sci Med Sci 2004;59:255-63. Purser JL, Kuchibhatla MN, Fillenbaum GG, Harding T, Peterson ED, Alexander KP, et al. Identifying frailty in hospitalized older adults with significant coronary artery disease. J Am Geriatr Soc 2006;54:1674-81. Singh M, Stewart R, White H. Importance of frailty in patients with cardiovascular disease. Eur Heart J 2014;35:1726-31. Roe MT, Armstrong PW, Fox KA, White HD, Prabhakaran D, Goodman SG, et al. Prasugrel versus clopidogrel for acute coronary syndromes without revascularization. N Engl J Med 2012;367:1297-309. Singh M, Rihal CS, Lennon RJ, Spertus JA, Nair KS, Roger VL, et al. Influence of frailty and health status on outcomes in patients with coronary disease undergoing percutaneous revascularization. Circ Cardiovasc Qual Outcomes 2011;4:496-502. Lee DH, Buth KJ, Martin BJ, Yip AM, Hirsch GM. Frail patients are at increased risk for mortality and prolonged institutional care after cardiac surgery. Circulation 2010;121:973-8. Allepaerts S, Delcourt S, Wislez S, Boman X, Magne J, Petermans J, et al. Promoting factors of laryngeal penetrations in elderly. Geriatr Psychol Neuropsychiatr Vieil 2011;9:45-50. Ferraris VA, Ferraris SP, Moritz DM, Welch S. Oropharyngeal dysphagia after cardiac operations. Ann Thorac Surg 2001;71:1792-5. Afilalo J, Alexander KP, Mack MJ, Maurer MS, Green P, Allen LA, et al. Frailty assessment in the cardiovascular care of older adults. J Am Coll Cardiol 2014;63:747-62. Mack M. Frailty and aortic valve disease. J Thorac Cardiovasc Surg 2013;145:S7-10. Afilalo J, Eisenberg MJ, Morin JF, Bergman H, Monette J, Noiseux N, et al. Gait speed as an incremental predictor of mortality and major morbidity in elderly patients undergoing cardiac surgery. J Am Coll Cardiol 2010;56:1668-76. Chen MA. Frailty and cardiovascular disease: Potential role of gait speed in surgical risk stratification in older adults. J Geriatr Cardiol 2015;12:44-56. Leder SB, Suiter DM, Warner HL, Acton LM, Siegel MD. Safe initiation of oral diets in hospitalized patients based on passing a 3-ounce (90 cc) water swallow challenge protocol. QJM 2012;105:257-63. Leder SB, Suiter DM, Green BG. Silent aspiration risk is volume-dependent. Dysphagia 2011;26:304-9. Guyatt GH, Eikelboom JW, Gould MK, Garcia DA, Crowther M, Murad MH, et al. Approach to outcome measurement in the prevention of thrombosis in surgical and medical patients: Antithrombotic Therapy and Prevention of Thrombosis, 9th ed: American College of Chest Physicians Evidence-Based Clinical Practice Guidelines. Chest 2012;141:e185S-94S.